It’s almost like people don’t even try any more or like Hollywood, figured all the good ideas have been taken so let’s get on with the rehash. The generic name that you expect to see on Ironic Island in Second Life (I made up the name of the island since I don’t actually play SL, so don’t go looking for it). 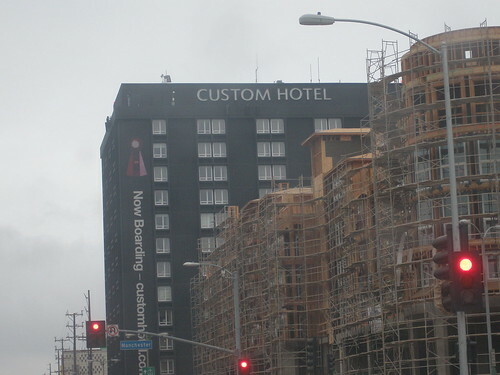 The font that is a straight rip-off of the original Corporate Boutique Hotel: W Hotel. The photos of the inside of the hotel look like Ikea and DWR had a design-off in it. And no one won. Comfortable, fun and whimsical, stylish yet modestly priced, Custom is an international boutique hotel in Los Angeles that thrives off the energy and atmosphere of its local environs, providing hotel guests a uniquely L.A. lifestyle experience. Our hotel is located minutes from LAX (Los Angeles International Airport) in Westchester. A short drive from Marina del Rey, Manhattan Beach, Venice, Santa Monica and Malibu, the hotel is conveniently situated near the 10, 405 and 105 freeways, allowing easy access to nearby businesses and leisure destinations within the general Los Angeles area and Southern California. Custom Hotel offers a stylish and innovative perspective to overnight stays. Situated high on a hill on Lincoln Boulevard, our 250 guest rooms and suites offer some of the city’s most stunning panoramic views of the Pacific Ocean, Malibu, Hollywood and Downtown Los Angeles. The hotel features espresso check-in, an on-the-go breakfast bar, Bistrotek restaurant, heated outdoor pool, stadium sundeck, Hopscotch pool bar and grill, poolside cabanas, fire pit and DJ lounge. That second paragraph sounds like it was ripped from my hotel I created in The Sims 2. And what the hell is ‘espresso check-in’? Do they load you up with coffee while they take forever checking you in just like the W Hotels? Or are they being cute and it’s supposed to be like ‘express’? I have no idea. The only thing I do know it that supposedly it’s “a good layover”. The effect would have been better if it was a white building with blue letters. “But not even the soft wash of dusk could help the houses. Only dynamite would be of any use against the Mexican ranch houses, Samoan huts, Mediterranean villas, Egyptian and Japanese temples, Swiss chalets, Tudor cottages, and every possible combination of these styles that lined the slopes of the canyon. Sharpen your gaze, Fab. Nathanael West did and he wasn’t even from L.A.
How funny you should post on this. I just saw this for the first time today. My friend, who just graduated from LMU, said he went drinking there and stayed there. He seemed to like it. Lame name though, I agree. @dave…we were thinking of going over there for drinks…once we get some money and wind up all the way over there, we probably will. @fraz…like the old Lucky store brand items “Cereal”. I hear their restaurant, Bistrotek, is great, from a friend of mine who went there to do a review.